Students and teachers of Chinese history and philosophy will not want to miss Daniel Gardner's accessible translation of the teachings of Chu Hsi (1130-1200)--a luminary of the Confucian tradition who dominated Chinese intellectual life for centuries. Homing in on a primary concern of our own time, Gardner focuses on Chu Hsi's passionate interest in education and its importance to individual development. For hundreds of years, every literate person in China was familiar with Chu Hsi's teachings. They informed the curricula of private academies and public schools and became the basis of the state's prestigious civil service examinations. Nor was Chu's influence limited to China. In Korea and Japan as well, his teachings defined the terms of scholarly debate and served as the foundation for state ideology. Chu Hsi was convinced that through education anyone could learn to be fully moral and thus travel the road to sagehood. Throughout his life, he struggled with the philosophical questions underlying education: What should people learn? How should they go about learning? What enables them to learn? What are the aims and the effects of learning? 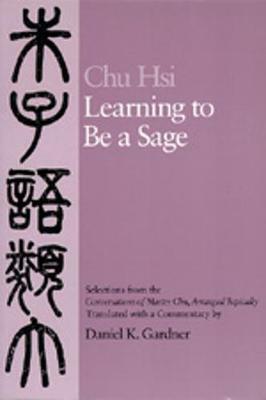 Part One of Learning to Be a Sage examines Chu Hsi's views on learning and how he arrived at them. Part Two presents a translation of the chapters devoted to learning in the Conversations of Master Chu.